Home > Travel > Vacation > Contiki Reviews: Ready to Plan Your Trip of a Lifetime? Does planning a trip stress you out? Not sure where to go or what to see? You’re not alone. Why not avoid the stress of travel planning and book your next adventure through Contiki? Contiki offers trips with almost everything planned out and included in your fee including accommodations, meals, activities and more. All you have to do is select the trip you want and pay for it. Contiki vacations target a specific age range (18-35 only) and style of traveler (which we will discuss below), so it’s important to make sure this is the travel experience you are looking for. After all, we want you to have a great time on your vacation! We’ll help you determine if Contiki trips are right for you. 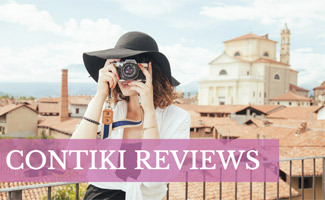 To help show you Contiki’s prices we’ve selected a few trips to review. Please note that there are many other trips available aside from the one’s we’ve used as examples below, so if there are some trip guidelines you’re interested in, be sure to punch them into Contiki’s website. It is also important to note that these prices and itineraries are based on what was offered at time of writing so they are subject to change. Below are the details and pricing for each trip. Below are three Contiki tours in Europe including Contiki European highlights to give you an idea of what you get for the price. Below are some Contiki tours reviews with highlights for trips to Asia. Need some motivation to travel? Listen to these peoples’ amazing stories. When you think back to this year, what will stick out in your mind? In April 2016, FlightRadar24 studied the activity of flights over the U.S. in a 24 hour period. How many flights do you think they tracked? Come on, give a guess. Okay, ready to hear how many flights were tracked — 164,209 flights. That gives you 164,209 opportunities every day to go somewhere new and experience a fun trip. That trip could be through Contiki, one of its competitors, or a trip that you organize on your own. If you want to explore other tours like Contiki, check out its competitors in our comparison article. I’m sorry, but what trips are these people going on do they think if they planned it on their own. That for the same price they could go to Europe get private tours for everything and stay in 4-5 star hotels? Especially in the high season. Now yes if you planned a Europe trip on your own, you could definitely get it cheaper. But by staying in hostel dorm rooms (in the high season in major cities you’re paying min $50 a bed), staying a hostel with a kitchen so you can go to the local markets and grocery stores. Cooking you’re own food saves money, as well as eating street food. Also having your big meal at lunch time because of lunch specials. As for private tours? for each attraction and city you are looking at anywhere from $200-$400, and no those private tours are not “private”. They still end up being a group tour. A 4-5 star hotel during the high season? talk about $500+ a night. These reviewers have obviously never traveled to Europe on their own, and have never even tried to research or plan a Europe trip. In western Europe (Paris, Rome, London) you should be budgeting $75 a day on top of accommodation. So plus the dorm bed $125 a day. A 17 day trip: $2125. Contiki 17 day tirp: $3445. So a savings of $1320, but that $2125 doesn’t include a tour guide or transportation from each city. So good luck with that savings of being able to stay in a 4-5 star hotel and private tours. Courtney, thanks for sharing and yes we agree that there is value in booking through a company like Contiki vs DIY. Since they are a registered travel agency they can often benefit by getting better rates for accommodations and tours. I’ve personally done group travel a few times and enjoy the company and bonding when visiting a new place. Plus, it’s nice to have a service take care of all the heavy lifting when it comes to researching things to do, vetting the best places to eat, etc so you can just show up and have fun! I’ve not used Contiki before but LOVE group travel! Such a fun way to meet new people who will become life long friends because you bond so much! As a 30-something wanderlust it’s more difficult to meet people but group travel like Contiki makes it easy peasy and fun!